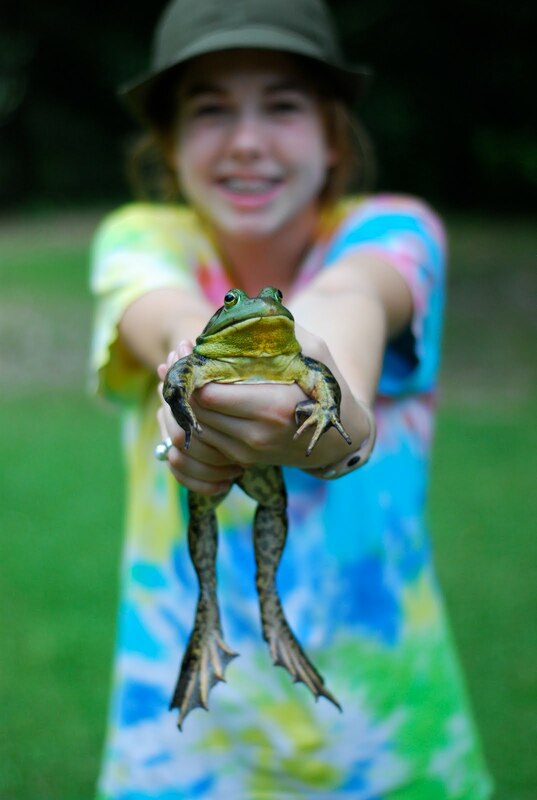 Elizabeth brought home a new "pet" the other day! 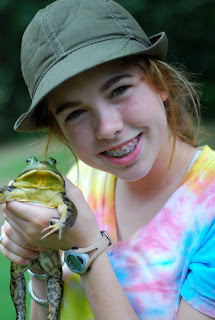 This lovely creature was acquired from someone who went frogging and likes to eat "frog legs". When Elizabeth saw this frog, she asked them if she could have one to keep and saved him from the frying pan. She brought Melvin home to a palatial estate.......a baby pool with logs and rock for him to hang out on, plenty of live crickets and grubs to eat and a lovely view of my garden and lots of pine trees....Melvin thought he died and had gone to heaven. She had to be very careful when holding him as he can jump ten feet in one hop. Even a top cross country runner can't keep up with that! If she dropped him, that would be the end of Melvin. All went well until about a week after Melvin arrived. We went out to check on Melvin and he was nowhere in sight. We discovered that the cage lid we place on top of the pool had been accidentally set down on a log and was a bit ajar. This gave Melvin his opportunity to escape and I guess he is now amongst many friends, croaking "Hello" to us at night. Goodbye Melvin.....you will be missed my many and were loved by all!